Boy is summer flying by and September is right around the corner! That means back to school, back to routines and back to school lunches. Starting a new school year is exciting so why send the same boring old PB&J every day for lunch? Switch things up for your kiddo (or yourself!) 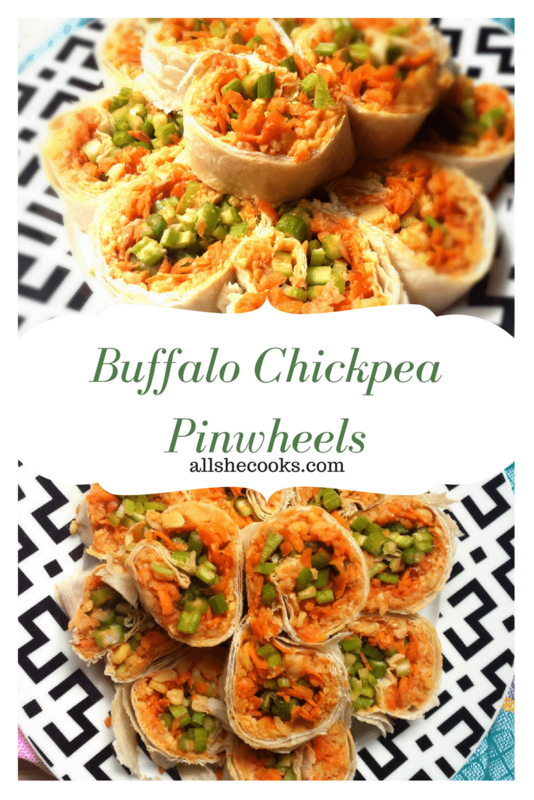 with these buffalo chickpea pinwheels. I don’t know about you, but by lunch time I’m in full on afternoon slump mode and in serious need of an energy boost. And by the way, these pinwheels are the perfect picker upper! In this post I outline some of the benefits of the bean, but basically chickpeas are an awesome source of plant based protein and potassium. Who knew potassium was in other things besides bananas? Chickpeas are also naturally cholesterol free, low in fat and rich in fiber, calcium and iron. A pretty big powerhouse if you ask me! For all these reasons, chickpeas are the perfect pick me up for an afternoon snack or lunch. For these pinwheels I add in some Red Hot salsa to get that extra kick and buffalo flavor. If you’re not one for spice, try mixing in some BBQ sauce instead! This will add plenty of flavor without the heat. Speaking of heat, these pinwheels are also great for those scorching summer days when turning on the stove sounds like a death sentence. No cooking required for these little rounds! For this recipe I used about three cups of cooked chickpeas which is about two cans. You can either buy canned chickpeas OR use my favorite method to cook them (which usually ends up being much cheaper) in the crock pot or slow cooker! Chickpeas triple in size when cooked, so add one cup of dried chickpeas to the slow cooker, fill the rest with water and cook on high for four hours. Easy (chick)peasy! 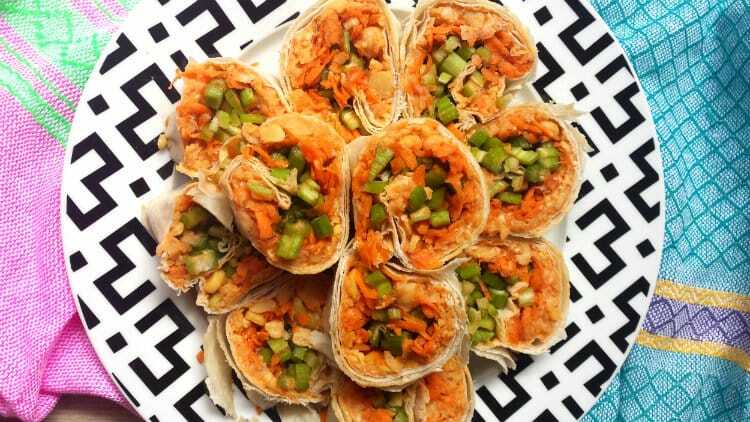 Spread a thin layer of chickpea mixture to tortillas, then layer on carrots and celery. 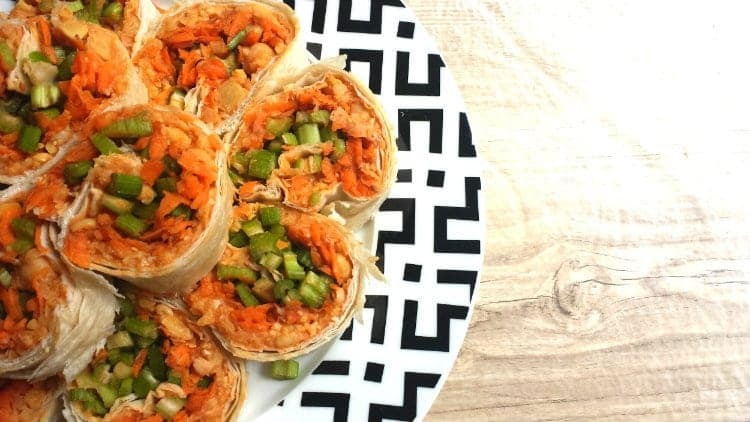 Roll up tortillas and cut into 1/2 inch or larger sections. Serve and enjoy!